Ludwig von Mises wrote, "[Economics] also calls entrepreneurs those who are especially eager to profit from adjusting production to the expected changes in conditions, those who have more initiative, more venturesomeness, and a quicker eye than the crowd, the pushing and promoting pioneers of economic improvement." Mises echos Zell’s view. "The entrepreneurial idea that carries on and brings profits is precisely that idea which did not occur to the majority...The prize goes only to those dissenters who do not let themselves be misled by the errors accepted by the multitude." Zell writes, “And great entrepreneurs are always great salespeople.” Appropriately, Mises used the term “promoter” interchangeably with “entrepreneur.” "The driving force of the market, the element tending toward unceasing innovation and improvement, is provided by the restlessness of the promoter and his eagerness to make profits as large as possible." Zell reads constantly. Many people do, but he turns the information into opportunities and profits. For example, he gleaned from the deferral of marriage that young people would congregate in cities and rent apartments. He doesn’t care what’s pretty, just what makes money. His company Equity lifestyle Properties (ELS) controls over 140,000 manufactured home and RV sites in 32 states and British Columbia. “Nobody in the sophisticated real estate world had ever gone close to one of these communities,” he writes. The ELS market cap from the 1993 IPO has grown from $296 million to over $6 billion. Trailer trash? Not hardly. Zell picked up assets on the cheap and made his reputation in the S & L crisis. As he writes, 20 years later in 2008 his phone rang off the hook with people wanting to join him again buying cheap buildings. However, the Fed got in the way. The market was not allowed to clear. “With low to nonexistent interest rates, there was no cost to lenders to carry assets on their books. Now the real estate lending industry’s mantra was ‘Extend and pretend.’ A rolling loan carries no loss.” No one was forced to sell and there were no bargains. There is no clearer manifestation of the Austrian Business Cycle Theory. Central bank interference creates lower rates and the amount of money available for investment increases. In turn, entrepreneurs respond to what they believe is an increase in savings, or a decrease in time preferences. These entrepreneurs then invest this capital in “higher orders” in the structure of production (like real estate). Investment then shifts to capital goods industries. Prices and wages are bid up in these capital goods industries. However, time preferences had not lessened. As the newly created money quickly permeates from business borrowers to wages, rents, and interest, the recipients of these higher incomes will spend the money in the same proportions of consumption-investment as they did before. Thus, demand quickly turns from capital goods back to consumer goods. Unfortunately, capital goods producers now have an increased amount of goods for sale and no corresponding increase in demand from their customers. Zell may not be aware of the Austrian Business Cycle Theory, but he has and will likely continue to make billions from it. 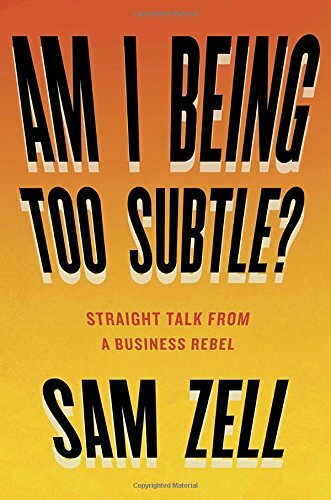 For anyone interested in entrepreneurship and particularly, real estate, Zell’s “Am I Being Too Subtle?” is a fun, down-to-earth and enlightening read.